Secluded estate on acreage, yet close to everything! 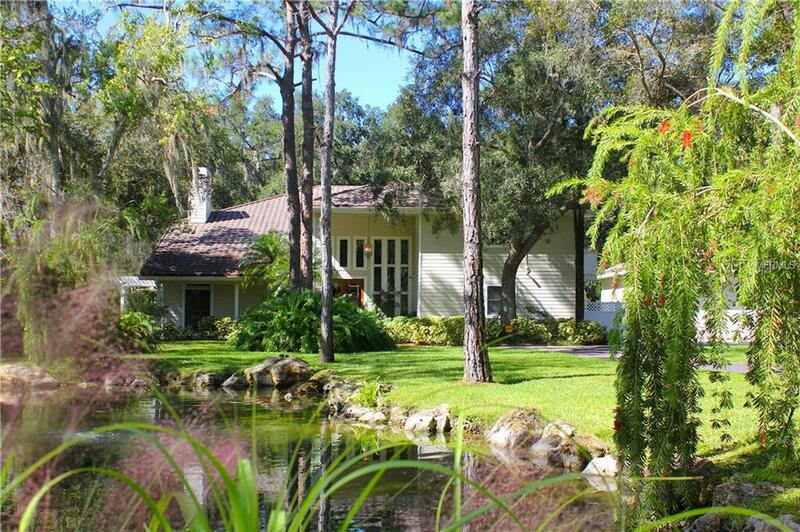 Private home on 2.5 acres of park-like grounds w/Koi ponds, Zen garden, rolling stream w/waterfall, & mature oak trees w/Spanish moss. Zoned Equestrian (A1) w/direct access to horse trails. Car enthusiast or tinkerers dream, w/attached garage & 2 detached outbuildings w/AC & utilities for workshops, garage space, RV/Boat storage, in-law suite, or home business. 4-bed, 4.5-bath home w/5,275 sq/ft - bright & open floorplan. Dramatic 2-story foyer leads to living room w/striking 20ft hearthstone fireplace. Gourmet kitchen includes an abundance of cabinetry & granite countertops w/stainless appliances, oversized center island w/induction cooktop, three wall ovens w/warming drawer, wine cooler, & trash compactor. Kitchen overlooks an expansive family room, great for entertaining. Separate office & an exercise room/5th bedroom w/en suite bath & sauna. Screened lanai features full outdoor kitchen, multiple seating areas, & huge heated salt water pool & spa. Spacious master suite has a fireplace for cool evenings & includes two walk-in closets, separate sitting room/nursery, & en suite bath w/dual vanities, jetted tub, & stand-alone shower. Upstairs bonus room w/access to the lanai via balcony & spiral staircase. 3 more bedrooms on 2nd floor, 2 w/en suite baths, 1 w/balcony, & all with large walk-in closets. Upstairs & downstairs laundry rooms offer convenience in this family-friendly house. Gated & fully fenced. No deed restrictions or association fees. Listing provided courtesy of Merrickdamon Real Estate.